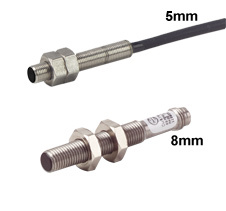 These unique Cutler-Hammer® Inductive Proximity Sensors are designed to be used in extremely small spaces. A wide variety of models are available with housing diameters of 8 mm (0.31") and a very small 5 mm (0.20"), allowing you to choose the one that best fits your application. The sensors are 3-wire devices that operate from 10 to 30 Vdc. Both shielded and unshielded versions are available. Sensing range 3 mm (0.1 inch) extended range, Shielded NPN. Sensing range 3 mm (0.1 inch) extended range, Shielded PNP.